Since 2003, we've been helping busy people organize their homes, their offices, their schedules and their 'to do' lists....so they can focus on their priorities and balance their lives. Kate S. Brown, Certified Professional Organizer ® owns and operates Impact Organizing. She specializes in working with clients who are easily distracted or who are dealing with depression, anxiety or life transitions. 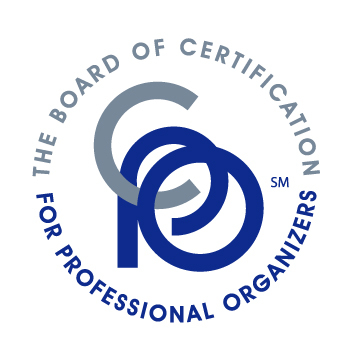 We uphold the National Association of Professional Organizers (NAPO) Code of Ethics as well as the Board of Certification for Professional Organizers (BCPO) Code of Ethics. Why should our clients care that we're committed to the highest ethical standards in the industry? Ethical behavior matters when you engage an organizing professional, because you want your personal information kept confidential. You also want to be sure that the company you hire is qualified to assist you with your specific organizing challenges. FInally, you want to know that you're working with an organizing professional who behaves with integrity and who puts your needs foremost when recommending products or services in the course of working together with you. Learn more about our professional expertise and explore our service levels tailored to your preferences... or find out how to get started. If you don't have time to read more, just contact us now and we'll schedule your free phone consultation. "As we dealt with my sister's sudden loss from afar, Impact Organizing gave us peace of mind. ...Beyond home staging, Kate suggested local charities that would pick up donations reliably, and recommended professional and reasonably priced vendors for painting, rug installation, interior and exterior cleaning, and more. My family and I enthusiastically recommend Impact Organizing."